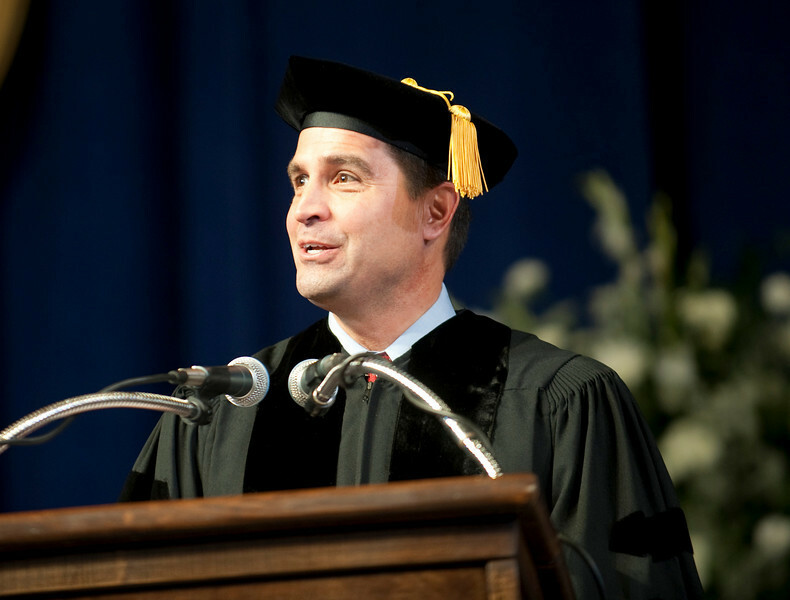 Today's college graduates needn't fear the future because they can help shape it, Congressman Brad Ellsworth told students completing their degrees at Indiana State University on Saturday (Dec. 19). "Take up the challenges that face the country and make them your own," Rep. Ellsworth said during his alumni address as part of Indiana State's winter commencement. Despite 23 years in law enforcement, Ellsworth said the scariest thing he ever did was run for Congress - that is, until he won the 2006 election from Indiana's 8th District. "I didn't back away from challenges and opportunities and neither should you. In a country where I can go from a cop to Congress overnight, anything is possible. Never allow fear to stand between you and your dreams," he said, "I hope you have big dreams." Recalling former President Bill Clinton's statement that there is nothing wrong with America that cannot be fixed by what is right with America, Ellsworth said, "You graduates are what's right with America. Commit yourself to making a difference." Ellsworth holds two degrees from Indiana State, a bachelor's in sociology from the former Evansville campus and a master's in criminology. He added a third degree Saturday, picking up an honorary doctor of laws at the conclusion of his commencement address. Building on a quote from the "Last Lecture" of the late Carnegie-Mellon University Professor Randy Pausch, who said brick walls exist not to keep us out but to show us how badly we want something, Tichy spoke of how the Indiana State community helped him break down a brick wall of his own building. While he took advantage of every opportunity available to him when he first entered ISU, stress, frustration and personal challenges at the start of his sophomore year caused him to stop attending class and miss meetings and activities. By his junior year, Tichy's grades had dropped dramatically and he was concerned he wouldn't be able to climb the brick wall he had built. "But ... it was as if there had been an ISU staff meeting discussing "Where's Bobby?" as if I was the Waldo of Indiana State's campus," he said. "I had multiple people approach me asking where I had gone, what had happened, and if there was anything they could do. My freshman year, I had been fully aware of the opportunities to be involved; but what I hadn't realized was that so many people I had encountered along the way cared about me as a person, and not just as another student." Following that low point, Tichy again took advantage of the opportunities Indiana State offers. He served a second stint with the Student Government Association and, with the help of the Center for Business Support and Economic Innovation, he landed an internship with a growing software company and launched his own Web site design firm. "Each of us has run straight into our own brick wall, climbed over it and come out victorious - all because we wanted it badly enough," he said. "Now it's up to us, with the knowledge we have received from Indiana State University, to overcome those barriers and brick walls for the rest of our lives." 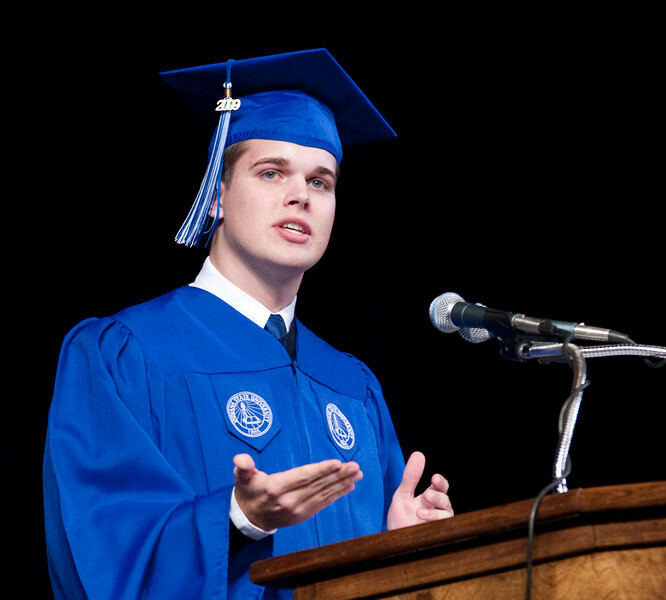 Approximately 800 graduates completed degrees from Indiana State this summer and fall, including 500 bachelor's degrees, 50 associate degrees and 200 master's degrees. The university also awarded 35 doctoral degrees and 27 educational specialist degrees. Also during the winter commencement ceremony, Analyssa Noe was recognized with the President's Medal for Leadership, Scholarship and Service. Noe, of Wetmore, Kan., completed a bachelor's degree in legal studies with minors in women's studies and civic leadership. Terre Telschow of Sullivan received the Hines Memorial Medal as the graduating senior with the highest honors classification cumulative grade point average in all courses taken at Indiana State. University President Dan Bradley told graduates he continues to be impressed with all that Indiana State students accomplish. "I am looking forward to seeing you enthusiastically apply the skills and knowledge you have garnered while at ISU to advance your careers, serve your communities and literally help change the world," Bradley said. Alumni, student speakers sent December ISU graduates off with a call to dream big and overcome obstacles.